It is important that the board is up to date at any time. This is the best, and often the only, tool P.O.s have in order to know where each team stands with everything it’s tackling. Make sure you are always moving the tickets you are handling to the appropriate column depending on their state, as shown in the following diagram. Let’s say you are starting working on a ticket. If you are going to work solo, then you should assign yourself to the ticket on JIRA. This reminds everyone who is working on what. If more than one people are working on the same ticket, then at least one person of the people involved should be assigned (probably the one who started the initial work on the ticket) and the assignee can be updated as work is progressing. As soon as you start, you should move the ticket to the Started column. As mentioned in the Git section, you should also create a branch whose name has a TX-#### prefix that matches the ticket id. 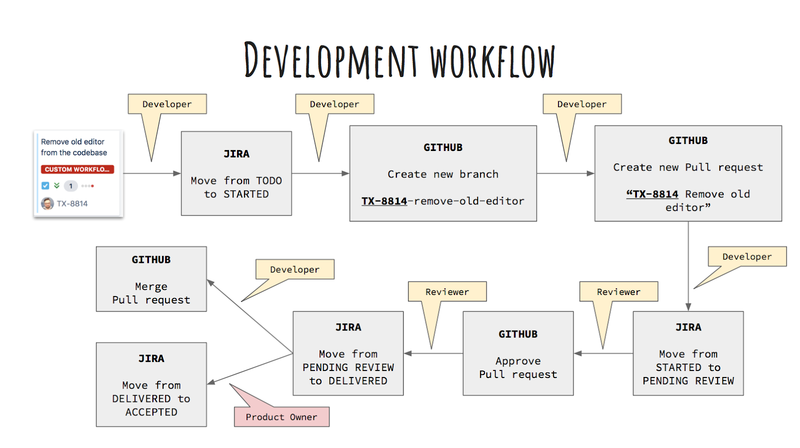 This activates various automations between JIRA and Github and gives us better tracking of things. At some point, you will create a PR for this ticket. Make sure its name starts with the ticket ID (TX-####). When the PR is ready with all necessary information, move the ticket from Started to Pending Review. The reviewer will now take over. If the PR is approved, the reviewer is responsible for moving the ticket to the Delivered column. If the PR is rejected instead, the reviewer is responsible for moving the ticket to Started. When the requested changes are made, you should again move the ticket to Pending Review and ask for a new review. This cycle can be repeated as many times as necessary. After a PR has been approved and the ticket has been moved to Delivered, you can merge the PR, provided that there is no condition that blocks you from doing so (e.g. another PR needs to be merged first on the same or on another repository). The reviewer can also merge the PR, after first conferring with the assignee and/or getting approval from the P.O. of the team. The P.O. will decide if everything about this ticket can be considered finished. In that case, the P.O. will move it to Accepted. Otherwise, the ticket will go back to TODO. Commenting on tickets is reserved for high-level information. Use it to inform the P.O.s, Support, etc of anything significant that might be of interest to them. Technical information should instead go to the corresponding PR(s). In order for a PBI to be added to a sprint it must contain enough information so that the development team understands what needs to be done in order to deliver the increment. All development teams working on the same product should conform to a common Definition of Done (DoD). This ensures that all teams follow the same principles, quality guidelines and practices while delivering increments during a sprint. However each team should feel free to create a more detailed DoD based on their custom needs, which however should extend and confront to the cross-team DoD, acting as a superset. Created by Transifex with GitHub Pages. The content of this page is licensed under the Creative Commons Attribution 4.0 International License.